With so much sensational fruit and an abundance of summer berries available at the moment, we hope that everybody is busily cooking and tasting the recipes in the Bream Creek Farmers Market Cook Book. If you are making the gorgeous Pirates Bay Berry Farm Apple and Raspberry Shortcake, you might need to pop next door to borrow an extra cup of plain flour, as it has come to our attention that this flour is missing from the ingredients list in the recipe. Please make a note in your copy of the Cook Book to add one cup of plain flour to the ingredients list for the shortcake pastry. The cup of plain flour should be added to the food processor, along with the self-raising flour, when making the pastry. This will ensure that your recipe turns out correctly. 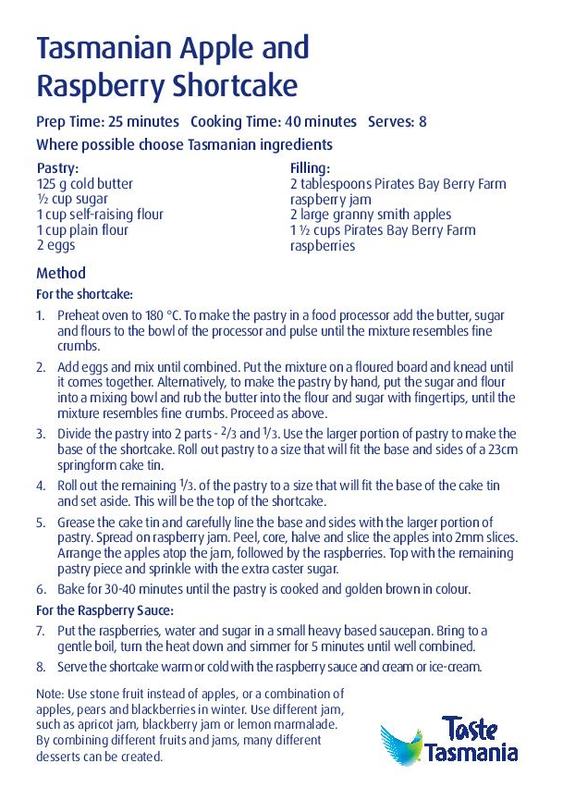 The amended recipe is printed correctly below, as seen on the Taste of Tasmania promotional recipe cards. These recipe cards are being used as a promotional tool by the Taste and we are thrilled to be a part of it! They will be freely available to Taste patrons and the Bream Creek Farmers Market is proud to have provided 4 recipes for these cards – they are a wonderful promotion for our region, for the Bream Creek Farmers Market as well as local businesses such as Pirates Bay Berry Farm. Pirates Bay Berry Farm is located at Eaglehawk Neck. All products are made by hand and contain no artificial colours or preservatives and the product range is fabulous – lemon and ginger marmalade, strawberry and rhubarb jam, blackcurrant jam, boysenberry jam, silvanberry jam, triple berry jam, blackberry jam, raspberry jam, raspberry and rhubarb jam, as well as raspberry, blackberry and boysenberry dessert sauces and a range of savoury sauces. With a crispy, sugary crust and luscious layers, this berry shortcake looks especially beautiful when sliced. It’s perfect for a decadent afternoon tea and fancy enough to serve for dessert. Preheat oven to 180C. To make the pastry in a food processor add the butter, sugar and flours to the bowl of the processor and pulse until the mixture resembles fine crumbs. Add eggs and mix until combined. Put the mixture on a floured board and knead until it comes together. Alternatively, to make the pastry by hand, put the sugar and flour into a mixing bowl and rub the butter into the flour and sugar with your fingertips, until the mixture resembles fine crumbs. Proceed as above. Divide the pastry into two parts – 2/3 and 1/3. Use the larger portion of pastry to make the base of the shortcake. Roll out pastry to a size that will fit the base and sides of a 23cm springform cake tin. Roll out the remaining 1/3 of the pastry to a size that will fit the base of the cake tin and set aside. This will be the top of the shortcake. Grease a 23cm springform cake tin and carefully line the base and sides of the tin with the larger portion of pastry. Spread on raspberry jam. Peel, core, halve and slice the apples into 2mm slices. Top with the apples, then the raspberries. Top with the remaining pastry piece and sprinkle with the extra castor sugar. Bake for 30-40 minutes until the pastry is cooked and golden brown in colour. Put the raspberries, water and sugar in a small heavy based saucepan. Bring to a gentle boil, turn the heat down and simmer for 5 minutes until well combined. Serve the shortcake warm or cold with the raspberry sauce and cream or ice-cream. Use stone fruit instead of apples, or a combination of apples, pears and blackberries in winter. Try Use different jam, such as apricot jam, blackberry jam or lemon marmalade. By combining different fruits and jams, many different desserts could be created. Cover raspberry plants with netting to keep the birds (and the kids!) from getting to them. When pruning raspberries, cut spent canes off at the base (these are the canes that fruited this summer). Tie up remaining canes into bundles or even try plaiting them together – this will help them support each other and produce an abundant crop for the following year.